This article is about the model introduced in Halo: Combat Evolved. For the model introduced in Halo 5: Guardians, see Type-54 plasma pistol. "The Type-25 DEP is the bread and butter of Covenant small arms—almost as common as the MA5 is with the UNSC. After the Covenant Carrier jumped there were some areas of Mombasa where plasma pistols covered the ground like leaves—that maneuver killed a bunch of dudes on both sides." 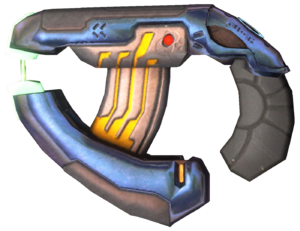 The Type-25 Directed Energy Pistol (Type-25 DEP), also known as the plasma pistol, is a Covenant infantry firearm, carried commonly by the smaller species, such as the Unggoy, Kig-Yar, and the Yanme'e, but is occasionally used by larger species such as the Sangheili and Jiralhanae; as such it is the most commonly encountered Covenant energy weapon. While weak on its own, the plasma pistol has a wide variety of functions and becomes deadly in large numbers. A blueprint of a plasma pistol. The plasma pistol is a Covenant directed-energy weapon that was reverse-engineered from a Forerunner device. The weapon is powered by a battery cell and has a power output of 100-150 KV at 2~3 dA, but when overcharged, the power output is 1.5 MV @ 2~3 dA. The Type-25 DEP is a semi-automatic weapon using a single collimator design that gives the weapon its smooth and aerodynamic, claw like appearance. The Type-25 DEP's functionality is straightforward, the rear section of the pistol has a holographic display which indicates temperature as the weapon is fired—in the center of the holographic display is a small red pad, this pad is the Type-25 DEP's safety and activation mechanism. Before the plasma pistol can be fired the user must place his thumb on the pad, the pistol then activates and can be fired. On the left side is another small red button this opens the top heating vent and allows access to the weapon's internal components. With the dissolution of a centralized manufacturing control—as a result of the Great Schism and fall of the Covenant—new production of plasma pistols have appeared in a bewildering variety of casing styles and adornments. Much to the consternation of UNSC intelligence officers tasked with categorizing new plasma pistol variants, within this broad type classification are innumerable, different sub-classes. This is due to the Covenant's loose (by human standards) interpretation of "standardization" and disdain of serial manufacturing techniques. The plasma pistol has two modes of fire, semi-automatic direct and semi-guided area of effect (AOE), also known as "overcharge". When rapidly tapping the trigger, the plasma pistol will fire small bolts of plasma. These bolts deal little damage to targets protected by energy shields, though still more than most bullet weapons. Against unarmored targets, though, the lethality of the Type-25 DEP is extreme. Injuries inflicted to a victim are severe third-degree burns, this level of injury causes the wound to be cauterized instantly upon impact. Body fluids would be subjected to flash vaporization, inducing a strain or a shock on the body after impact, fluids trapped in organs or arteries in addition to the rapid expansion of heat would cause ruptures or small explosions causing additional damage to the target. Near misses can also cause injury to the target, as they produce severe burns to the area they pass, this can also cause heat trauma or heat stroke from the extreme temperatures of the bolt. Should the plasma strike cover, the impact can cause splash damage by flinging heated debris, though the blast radius is smaller than most Covenant explosive weapons. The semi-auto firing mode can be used until the weapon overheats, after which it must cool down for a few seconds before it can be used again. As the weapon approaches low battery, it may sputter and fail to fire. The Hesduros-manufactured pistols used by Jul 'Mdama's forces fire more powerful plasma bolts, with a comparable increase in energy use per shot. An ODST primes a plasma pistol's overcharge. "The trigger is soft—no feedback—there’s no break that tells you when the overcharge is gonna kick in. First time I did it was by accident and it damn near sprained my wrist." If the plasma pistol's trigger is held for a few seconds, the plasma at the tip will gather into a large spherical mass. Releasing the trigger will fire a single bolt of larger size than usual. This bolt, if aimed correctly, will track its target for a short distance if they attempt to dodge. The overcharged bolt creates an electromagnetic pulse, stunning most electronics. If the target is protected by energy shields, all but the strongest shields will break, allowing their body to take damage. If the overcharge strikes a vehicle, it will be temporarily disabled and rendered helpless for several seconds. As such, even the weakest Covenant infantry can thwart an assaulting Spartan or vehicle, forcing their foe to retreat or creating an opening for their allies. Should an overcharged bolt strike an unarmored flesh target, it will result in instant death. However, after the overcharged bolt is fired, the pistol will automatically overheat. Until it cools down the pistol cannot be fired in this mode, giving an opposing target enough time to counterattack. Using the overcharge frequently will also drain the battery faster than usual. The plasma pistol is a great close-to medium range weapon. While it can't inflict high damage at long range, the plasma pistol can be used at a distance if the user fires slowly and aims carefully by leading the target. It is extremely efficient at killing "soft" targets, while dealing large amounts of damage to a heavily armored target. Its overcharge ability is extremely dangerous to shielded infantry, and to non-shielded infantry. Because of the extreme temperatures released, a vehicle running on a hydrogen engine, or one that is lightly covered, can be damaged or disabled if the overcharged bolt hits it — in addition to the high temperatures, the electromagnetic bottle containing the plasma can produce an EMP which can disable any electronic device within range. When compared with the plasma rifle, the plasma pistol's non-overcharged firing mode is far more accurate at medium and long ranges, although the plasma projectiles tend to arc downward at long range. SPARTANs and Sangheili have the ability to dual-wield plasma pistols, doubling their efficiency in close- to mid-range combat situations. If fired fast enough, the high velocity of the plasma projectile coupled with the force of the kinetic impact, can knock over, or stun infantry. The plasma pistol, when fired continuously, or when an overcharged bolt is fired, will overheat because of the rapid cycling, loading, ignition, and release sequence of energy. To prevent the weapon from being damaged, the Type-25 DEP temporarily shuts down and opens a cooling vent to allow the excess heat to dissipate before the weapon reactivates. This process leaves the weapon temporarily inoperable. Infantry who are not aware of the function of the plasma pistol can get killed because of this. Human military experts and scientists do not understand how Covenant plasma weapons work, or how they are recharged; as such when the battery is depleted the plasma pistol must be discarded or replaced. At 10% charge level the plasma pistol will begin to misfire, this is due to the battery's inability to deliver enough energy to start and complete the ignition and release phase of operation. As such this hampers the operators use of the weapon. Continuously holding down the trigger while in overcharge mode will rapidly deplete the energy source, and if not careful the weapon can be wasted before firing a single round. Another disadvantage is its short range which is about 10–25 meters depending on the charge level. Although the plasma pistol can strike a target at long ranges, it is not suited for long-range combat, due to two distinct properties of the weapon's operation. The first is the rate of thermal expansion which is determined by the rate of the bloom of the bolt; "blooming" is the result of plasma breakdown in the air at energy densities of around a megajoule per cubic centimeter. This effect causes the plasma to defocus and dissolve into the atmosphere. It can be more severe if there is fog, smoke, or dust in the air. As the bolt is accelerated away from the "barrel" of the weapon the plasma begins to decay as a result of the weakening magnetic field. Speed also factors in to this, the faster the bolt is accelerated, the farther the bolt will travel before the temperature of plasma begins to decay and the magnetic field becomes unstable and finally dissipates. As the bolt loses velocity it also loses kinetic damage as it travels longer distances. The plasma pistol can now be dual-wielded. Melee animation changed - instead of the Master Chief holding it in his left hand and punching with his right, he holds it in his right and punches with his left. Overcharged shot contrail has been removed. Less damage per shot, 26 shots are required to kill a fully-shielded Spartan instead of 15. The overcharged bolt does no damage to unshielded targets instead of killing a fully-shielded Spartan in 3 overcharged bolts. Rate of fire is slower. Overcharge charges up slower but has better tracking. Overcharged shots do not kick up as much dirt, dust, sparks and debris as the Halo: Combat Evolved counterpart. Green electricity is present between the "prongs" of the Plasma Pistol. 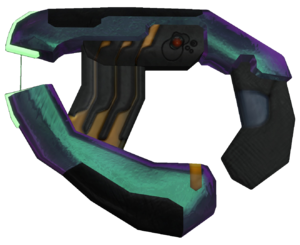 The color of the plasma pistol (blue) was darkened from Halo: Combat Evolved's version. The crosshairs of the reticule move closer together when the overcharge is locked-on to a target. The overcharge now takes 15% battery instead of 10-11%. The plasma pistol has only 200-300 shots before it runs out of ammo, instead of 500. Maintaining an overcharge without releasing decreases the battery rapidly (about 3% per second). Overcharges also drain 10% power in addition to the amount decreased when maintaining the charge. Takes slightly longer to cool down after overheating. If an overcharge impacts with a vehicle, the vehicle is temporarily disabled; same effect as the Power Drain. Shorter time to charge an overcharge when holding down the trigger. Tracking distance has been lowered; the overcharged bolt will only seek out targets at close range. Overcharged bolt has longer contrail than in Halo 2. 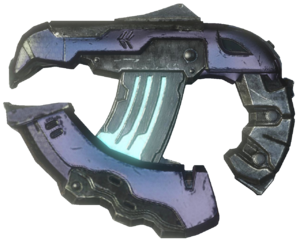 The plasma pistol is marginally weaker than it was in Halo 2, often requiring 1 extra shot to kill most enemies compared with its performance in Halo 2. The plasma pistol does the same amount of damage as the assault rifle against unshielded enemies; on Heroic difficulty, both the plasma pistol and assault rifle take 5 shots to kill a Grunt Minor, and 9 shots to kill a Grunt Major or Jackal. The plasma pistol now has 400 shots before it runs out of ammo. The plasma pistol is now purple instead of blue; it also appears to be smaller than in Halo 2. The plasma bolts in ODST are somewhat smaller and less pronounced than in Halo 3. The strength of the plasma pistol has been greatly increased. 10 shots are required to kill a fully-shielded Spartan instead of 26. The plasma pistol has received a graphical overhaul with noticeable changes to its design. Its texture appears to be more crudely metallic than in any previous game. Some other changes includes a small raised section on the top, presumably an iron sight and a more defined grip on the lower section. Overcharge bolt tracking has been reduced. The overcharged bolt creates small area-of-effect damage. The pistol produces a faint buzz after you equip it, because of its activation. The plasma pistol's rate of fire is reduced to compensate for its higher power. Its battery now takes one full energy unit per shot in Multiplayer (five shots in Campaign and Firefight). The overcharged bolt not only disables shields, but will also damage around one third of a SPARTAN's health points. The overcharge will now drain 15% of the battery per shot (10% in Campaign and Firefight). The player will now occasionally melee with the pistol itself, instead of only using their fist. Grunts can now use its overcharged function in Campaign and Firefight. Each shot drains 2% of the battery. An overcharged shot now drains 25% of the battery, which is much more than previous games. Orange markings on the weapon are now bright blue. The sounds have been upgraded. The overcharge is higher pitched and no longer buzzes while it's held. Like the original Halo 2 version, the plasma pistol does not lose battery while being overcharged and cannot disable vehicles. However, it can only be overcharged for 5 seconds before the charge dissipates and loses 9% battery. Less damage per shot, requires 26 shots to kill a fully-shielded Spartan. Cosmetically resembles the Halo: Reach and Halo 4 variations, most specifically the small "sight" atop the main body of the weapon, and the raised hologram at the rear. The overcharge is larger and emits a brighter glow. After overheating, the pistol emits a cloud of green steam. Suicide Grunts wielding plasma pistols. Plasma pistols do not drain shields instantly, even when overcharged. Grunts now overcharge plasma pistols in-game. Jackals are not capable of using them. Elites are not capable of using them. The maximum battery size is 200 as opposed to 100 in previous games. Ammo can be picked up. An overcharged shot resembles and behaves similar to that of a Fuel Rod. "It’s a damned ray gun—how come we don’t have ray guns?" "It’s great in built-up areas and clearing buildings. Anything over a couple dozen meters though? Not so much." "How the foxtrot does it track anything? Whatever—I guess that’s why I carry an MA5 instead of a TACPAD." "It’s just the right size and it feels good in your hands, but give me an M7 or an MA5 any day of the week." The plasma pistol was inspired by the "Zeus Class Fusion Pistol" from the Marathon series. Like the Fusion Pistol, the plasma pistol is a reasonable-damage single-shot weapon with an overcharge mode. However, the Fusion Pistol's overcharge was far more deadly in-game and could kill nearly any enemy in the game, with one limitation: if the gun was left overcharged for too long, it would explode violently, killing the wielder. In Halo: Combat Evolved, if the player remain idle while wielding a plasma pistol, John-117 will pull the top off the pistol, showing what seems to be a power cell similar to a round of the fuel rod gun. In Halo 3, the same will happen if the player remain idle for a while; the playable character will flip it open and the player will be able to see the internal mechanisms of the pistol. In the PC version of Halo: Combat Evolved, if the player has a modified controller with rapid-fire functionality, they can fire the plasma pistol as fast as the second highest turbo setting, which is as fast as the assault rifle. However, it overheats extremely fast. In Halo 3, it is the only dual-wieldable weapon that does not cause less damage per shot when dual wielded than when single wielded. (26 head/body shots single- or dual-wielded to kill with normal shields; as compared with the M6G that takes 5 head or 8 body single-wielded but 7 head or 11 body when dual-wielded). 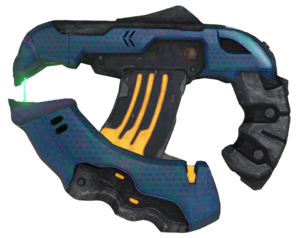 In the Halo trilogy, if the player's plasma pistol is running low on battery, (less than 10%) when they fire it, then it will occasionally splutter and refuse to fire. This may be due to the fact that the power cell is unable to focus the remaining energy into a ball of plasma. In Halo 3, if one looks at their shadow whilst holding a plasma pistol, one may notice a "cap" like protrusion on the back of the gun. This is actually the hologram on the gun that indicates if it is overheated. In the "Another Day at the Beach" video from the Halo 2 Multiplayer Map Pack, the ODST Butkis uses a plasma pistol to take down the shields of an Elite before Gunnery Sergeant Stacker uses a Battle Rifle to kill it, effectively using the Noob Combo. After killing the Prophet of Regret on "Regret" in Halo 2, he will drop a plasma pistol. He held the same weapon in Halo: Contact Harvest, and was rumored to keep it with him at all times in Halo: The Cole Protocol. In Halo: Contact Harvest, Dadab notes that the plasma pistol's lowest power setting is an effective source of light, whilst he is leading a group of Grunts in the dark. In Halo 2 Vista, it is possible to instantly destroy a Type-32 Ghost by aiming an overcharged bolt at the metal flaps on the back of the Ghost's wings. If the player overcharges the plasma pistol in Halo 3 and slowly release the trigger, it will not fire a shot. The plasma would slowly dissipate and disappear. This can be used as a way to prevent excess battery depletion when an overcharge shot is fired. The plasma pistol in PC versions cannot do this as the player is using a mouse to control the firing. In the Halo: Reach Multiplayer Beta, the sound effect for an overcharged blast was the same as when a circuit is hit in Marathon. In Halo 2 Vista, if the player is carrying the plasma pistol and are in active camouflage, one may see a polygon near the front of the weapon. In Halo 3, while using active camouflage, one can see a square where the heat monitor is. This indicates the hologram is a polygon. In the "Extras" section of the Halo 3: The Official Strategy Guide, it is stated incorrectly that the plasma pistol has a clip size of 10/100 when it does not have a clip size at all. The plasma pistol in Halo: Combat Evolved. A profile view of the plasma pistol from Halo: Combat Evolved. First-person view of the plasma pistol in Halo: Combat Evolved. Views of the plasma pistol in Halo: Combat Evolved. A plasma pistol overheating in Halo: Combat Evolved. A profile view of the plasma pistol from Halo 2. First-person view of the plasma pistol in Halo 2. The plasma pistol in Halo 2. The plasma pistol in Halo 3. An in-game profile view of the plasma pistol from Halo 3. Dual overcharged plasma pistols in action in Halo 3. The overcharged plasma bolt in Halo 3. A left-facing render of an active plasma pistol from the pre-beta development stage of Halo: Reach. A right-facing render of an active plasma pistol from the pre-beta development stage of Halo: Reach. A Halo: Reach beta render of an inactive plasma pistol. A plasma pistol overheating in the Halo: Reach beta. 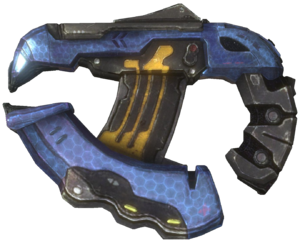 A side preview of the final in-game model of the plasma pistol in Halo: Reach. First-person view of the plasma pistol in Halo: Reach. A study of the plasma pistol in Halo: Reach. A study of the plasma bolt. First-person view of the plasma pistol in Halo: Combat Evolved Anniversary. First-person view of the plasma pistol in Halo 4. The interior of a plasma pistol in Halo 4. Reference model sheet of the plasma pistol in Halo 4. Orthographic views of the plasma pistol in Halo 4. Side view of the plasma pistol with default skin in Halo 4. First-person view of the plasma pistol in Halo 2: Anniversary campaign. First-person view while dual-wielding plasma pistols in Halo 2: Anniversary campaign. First-person view of the plasma pistol in Halo 2: Anniversary multiplayer. A Spartan using a plasma pistol on Stonetown. First-person view while dual-wielding plasma pistols in Halo 2: Anniversary multiplayer. A Spartan dual-wielding plasma pistols. The plasma pistol in Halo Online. The plasma pistol as a Laser Tag Replica. The basic Plasma Pistol in Halo Online on Diamondback. The golden Power Plasma Pistol in Halo Online on Diamondback.